Jeremy Lin is the New York Knicks most startling player. His story is exciting in that he graduated from Harvard in 2010 and was not immediately drafted into the NBA. At first he was playing in the NBA Development League (D-League) but has been playing in the starting line-up of the Knicks since early February. Brian's written an investigation that involves analyzing Lin's strengths and weakness as a point guard. 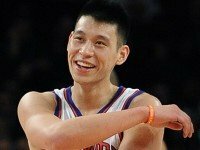 Bring Linsanity into your classroom with this great activity. For members we have Word docs, solutions and an Excel file for this post. Thanks for the post. Bringing practical math into the classroom is beneficial for all involved. I’ll be using this idea later this week. To enrich this idea, you may want to ask students to compare the salaries over the past decade for certain players.